Gefs looks worse and worse. Not too late but starting to think an inch of slop maybe best I can do. Too bad we can’t catch a break this year. FWIW I’m hearing talk that 18z Euro was LIGHTYEARS better than 12z...........can anybody confirm this concretely??? jmanley32 wrote: I'm just go sit back and see what happens. I'm not adding weather to my stress bucket its just not worth it. I am hoping for the best and just reading what you guys are saying and try make my own opinions but I won't say them cuz I honestly will prolly sound dumb. On that note keep us up to date fruquently if possible. So far I feel mixed which way it might go. Not right now, but maybe in the morning? rb924119 wrote: FWIW I’m hearing talk that 18z Euro was LIGHTYEARS better than 12z...........can anybody confirm this concretely??? Looks identical I can barely tell the difference. I still have not written off the very real possibility that I will wake up to more snow Friday morning than Sunday. 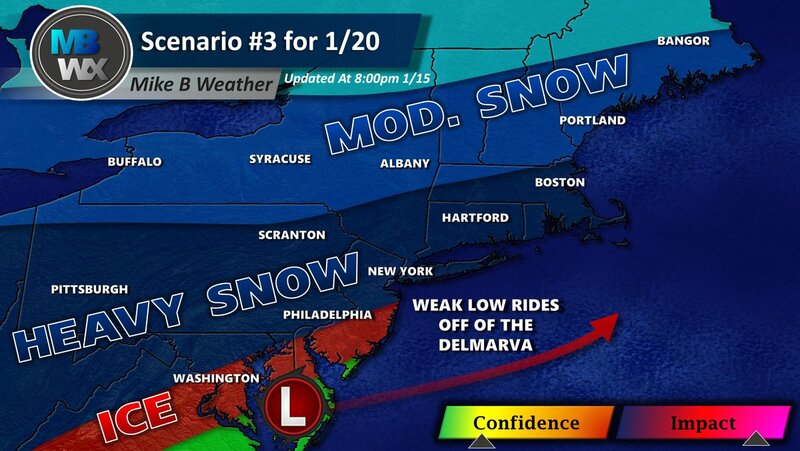 And that ain’t because Thursday night’s system is looking any stronger. Lol. My fear is I get a couple inches of snow at outset Saturday night, it washes away with rain by Sunday AM and then only add an inch or so when it goes back to snow Sunday afternoon. Here you go RB. These are the last 3 runs of the Euro including the 18z. As you can see the vortex and southern stream are becoming farther apart with each ensuing run. Unfortunately the 18z run only goes out to 90 hours but one can surmise that if the run were to continue, the low would be less amped. Good trends indeed. Have they ever been correct together? When time are the next set of model runs? This is pretty much the UKMET summed up in a precip map. If we avoid a phase with the TPV for long enough our low could go well south and produce snow down to the coast for I-95 30% chance of occurring right now. I'm so lost. Nam. Low is in Mexico.? NAM also sharpened up the 500mb trough for Friday and a bit south and is colder. Trends are good today we need this to continue and see the tpv to retract a bit more and not phase. It actually gets ahead of the southern energy and it just slides from West to NE and is UKIE like. UKIE0z runs and 12Z runs if hold then I think we are moving to a much more favorable solution at 500 if gefs and euro tick along with it. We aren't seeing massive changes by either model. NAM difrences albeit small like 50-75 miles but good positive moves here. I SAID THIS EARLIER TODAY BUT IT GOT BURIED SO HERE IT IS. FIR THOSE OF US THAT WANT BIG TIME SNOWS WHAT WE NEED IS EXACTLY WHAT YOU SAW WITH THIS PAST WEEKENDS STORM. 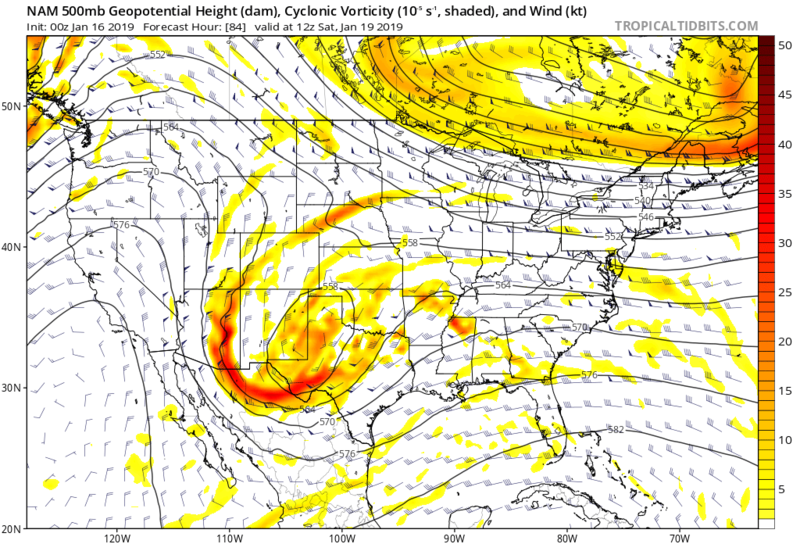 A COLLAPSING WEST COAST RIDGE AND A PV PRESS TO SUPPRESS THE STORM ENOUGH SO IT STAYS SOUTH. IRONIC THAT WE DIDNT WANT IT LAST STORM SO IT HAPPENED AND WE WANT IT THIS STORM. CAN WE SEE A REPEAT? This is gonna end up being one of those storms where being in the bullseye 5 days out is the kiss of death, isn't it? Just got home from being out all evening, things are looking a bit better I can see? IF the NAM, UKIE and Deep thunder are right. I have a sneaking suspicion that the GFS and Euro will follow suit and what syo talked about will happen. These subtle changes are great, lets just hope the real time progression shows this in the coming days and not just modeled. Huge shift south on 00z GFS surface map! !